Protect your wealth and identity from RF Theft! Walk in crowds with confidence! The Premium Product works on all currently used rf frequencies including door access, employee badges and payment systems and it looks trendy in your wallets and clutches! 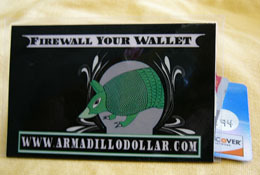 The Armadillo Dollar Dilly BLACK Card Folder holds up to five plastic cards and is designed to specifically protect your RF cards from wireless skimming and theft. This is the most effective shield because of its closeness to your RF cards. This item is 3 3/4″ wide by 2 1/2 ” when folded in half around several of your cards and fits easily into most wallets, clutches or purses.